I found the neatest thing at the store … it was called a puzzle cake. Usually I just make cupcakes and this is a set of cupcakes placed together in a pattern to build a cake. 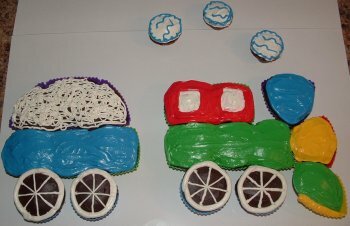 The pattern that I selected to make was a train birthday cake. My son, like so many other boys, loves trains. He was not specific about wanting a Thomas cake, so I make this train birthday cake out of fun primary colours. 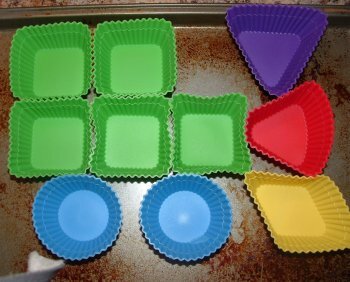 First, I laid out the pattern of cupcake holder shapes (on a cookie sheet) and made it look like a train. 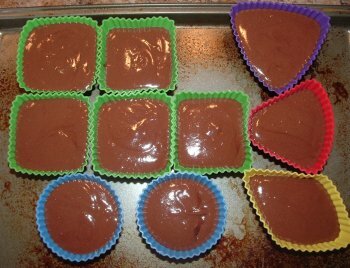 I filled the cupcake holders with regular cake mix (chocolate) up to the fill lines. Then I baked the cake. After the train cake was all cooled I iced the cake. At this point it did not look that fantastic and I started to worry. After it was all iced I was surprised at how the shape really started to appear to look like a train. The fun step was adding all the candy. I used numerous types of candy to decorate the cake. I used M&Ms, black licorice lace, black licorice, and red licorice bites. I also added some sour poppers and a stick candy (like an old fashion lollypop). Everyone was amazed at the creation! 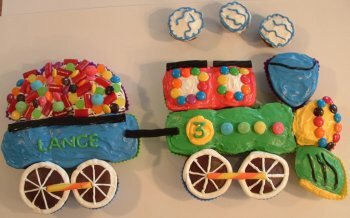 This train birthday cake was a fun, colourful and tasty surprise!